Long-term bisphosphonate use for the treatment of osteoporosis has been confirmed to be a risk factor of atypical femoral fractures . Compromised mechanical and regenerative properties of bone secondary to bisphosphonate use may result in delayed bone healing [2,3]. There are no standardized practices for the surgical treatment of atypical femoral subtrochanteric fractures. Intramedullary nails are widely used to manage subtrochanteric fractures, and they have good results . 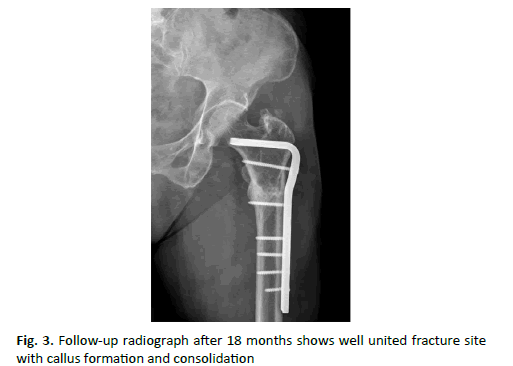 But when used to treat atypical subtrochanteric fractures, the outcomes have difference . There are some documented cases of fixation failure, use a short nail to treat atypical subtrochanteric fractures. The less biomechanically sound fixation achieved by short nail will predispose to cause delayed union and implant breakage. In terms of working length of the fixation, spanning the distal femoral region with a longer nail is necessary to treat atypical subtrochanteric fractures . There have been few reports in the literature of implant failure, use a long nail to treat the atypical subtrochanteric fracture. But we experienced two cases of implant failure caused by nonunion: treatment with 95-degree condylar blade plate with autologous cancellous bone graft. 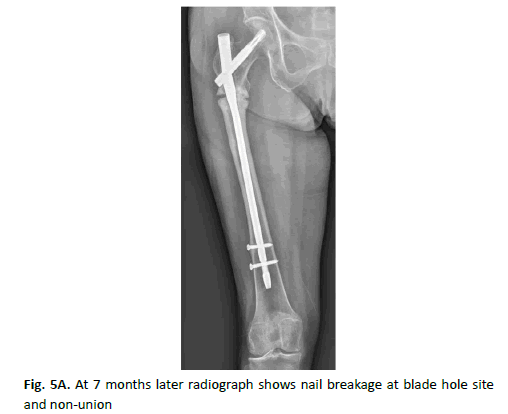 We reported two cases of failed fixation of the bisphosphonateassociated atypical subtrochanteric fractures treatment with long cephalomedullary nails and discuss the causes of the underlying failure mechanism. Both patients were informed that medical data concerning their cases would be submitted for publication, they provide agreement. A 72-year-old woman who had undergone long PFNA fixation to treat atypical subtrochanteric fracture at local medical clinic twenty months ago was admitted to our hospital suffered from thigh pain for one month. She had taken alendronate for osteoporosis for seven years, there was no other medical disease history. 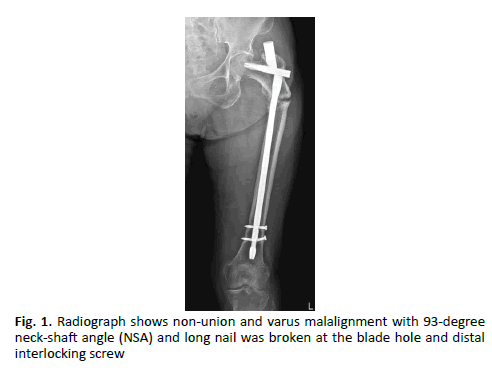 On admission, a radiograph showed non-union and varus malalignment with 93-degree neck-shaft angle (NSA) and the long nail was broken at the blade hole and broken distal interlocking screw (Fig 1). 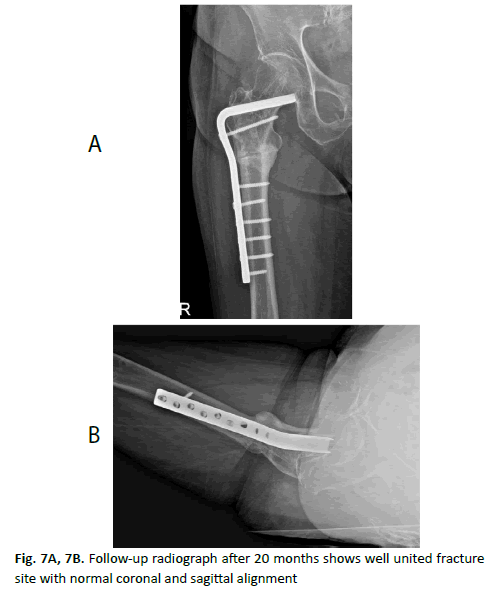 After removal of the broken implant, the fracture site was treated with valgus osteotomy to obtain more broad contact surface at non-union site followed by 95-degree condylar blade fixation and autologous iliac bone graft. 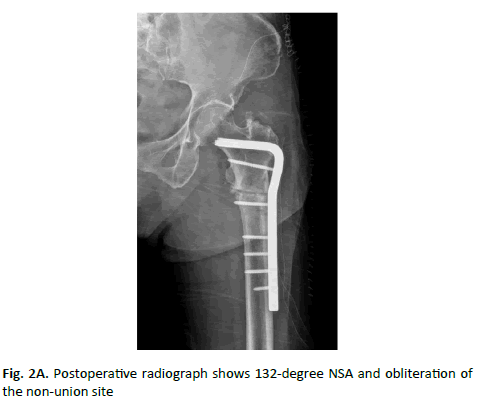 The radiograph showed 132-degree NSA and obliteration of the non-union site (Fig. 2A and 2B). She had taken teriparatide injection 8 times every week to enhance the bone repair potential. Nine months later, the follow-up radiograph showed callus formation and consolidation of the fracture site (Fig. 3). She had no subjective pain and could walk without aid. 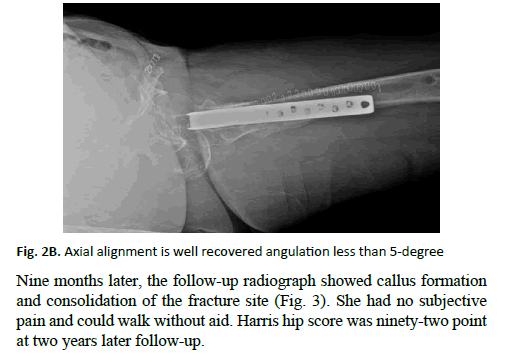 Harris hip score was ninety-two point at two years later follow-up. An 82-year-old woman was admitted due to the continuous groin and thigh pain for two months. She had taken revision fixation surgery nine months ago due to non-union and implant breakage (Fig. 4A and 4B). Her first treatment had done at a local medical clinic with short PFNA (Depuy Synthes). We had performed revision fixation with long PFNA (Depuy Synthes). Seven months after revision fixation she had felt dull nature thigh pain but endured in the home. The radiograph showed nail breakage at blade hole site and non-union of subtrochanteric fracture (Fig. 5A and 5B). 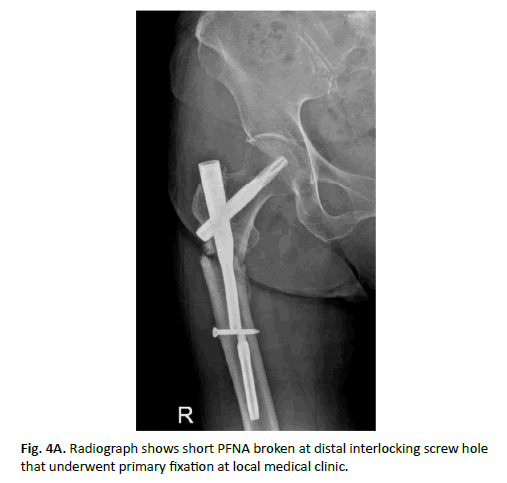 Figure 4a: Radiograph shows short PFNA broken at distal interlocking screw hole that underwent primary fixation at local medical clinic. After removal of the broken implants, the fracture site was osteotomized to obtain contact surface of the fragment. We also used the 95-degree condylar blade plate to get correction of the varus alignment and fixation, NSA was recovered to 130-degree (Fig. 6). Adjuvant teriparatide injection after re-revision fixation was done for 12 weeks. Eleven months later follow-up radiograph showed callus formation and obliteration of the fracture site (Fig. 7A and 7B). Two years later follow-up, she had no pain and well done the daily living activity. Harris hip score at 2 years later follow-up was ninety point. Atypical femoral fractures have emerged as one of the potential complications of bisphosphonates during the past decade. The bisphosphonate-associated subtrochanteric fracture was first reported in 2005 . This report identified bisphosphonate as a potential cause of delayed bone healing. Bisphosphonate accumulates in the mineral portion of trabecular bone and inhibits the mevalonate pathway of cholesterol synthesis. They induce osteoclast apoptosis and suppress osteoclast-mediated bone resorption and decrease bone turnover [8,9]. Impaired bone turnover eventually lead an accumulation of microdamage and insufficiency fractures . In areas of high stress, such as a subtrochanteric region of the femur, this accumulated microdamage may result in a pathological fracture. Subtrochanteric fractures have a high incidence of malalignment with difficulty obtaining and maintaining reduction. The typical deformities of subtrochanteric fracture are flexion, abduction and external rotation of the proximal fragment. Malreduction was reported in up to 37% of cases of unstable fractures . When obtaining a reduction, the deforming forces must be neutralized and subsequent reduction needs to be maintained. To preserve fracture site biology for bone healing, closed reduction is preferred. Many surgical tips and minimally invasive instruments have been developed to improve the reduction and maintenance of subtrochanteric fractures. The author preferred the joy-stick method that one of the most useful tip to control the proximal fragment. Atypical subtrochanteric fracture has a short oblique or transverse fracture pattern that has a low contact area at the main fracture line . So reduction and maintenance of the fragments are technically demanding. As with the vast majority of trauma-related subtrochanteric fractures, atypical femoral fractures are usually stabilized with cephalomedullary nails. A recent retrospective study demonstrated excellent clinical result with reported 98% healing rate . Long cephalomedullary nail with spanning the distal femoral region is a more biomechanically sound device, should be used whenever possible . Concerning the biomechanical characteristics of cephalomedullary nails, implant breakage is rarely reported. But nail breakage at the lag screw hole was reported due to non-union and early weight bearing . Malalignment was defined by more than 5 degrees of angulation in coronal and sagittal plane . Malreduction does not always relate to non-union and fixation failure in subtrochanteric fractures with normal bone healing potential . But in the treatment of atypical subtrochanteric fractures, malreduction is the most causative factor of the nonunion and fixation failure . 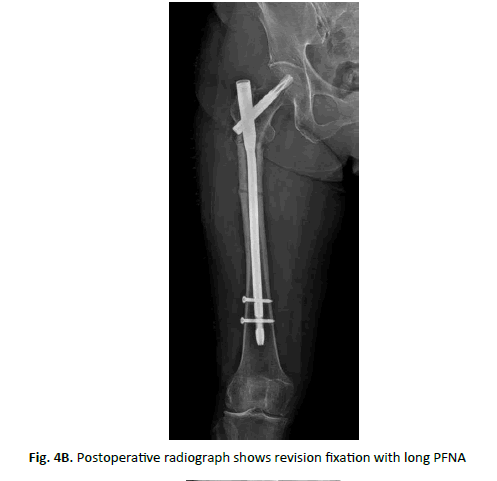 In both of our cases, the patients had undergone long PFNA with static distal interlocking screws fixation, and both nails had broken at the hole of the anti-rotation blade insertion site before bone healing. Thus, it is apparent that malreduction is prone to be non-union and implant breakage even though use a long cephalomedullary nail to treat atypical subtrochanteric fractures. 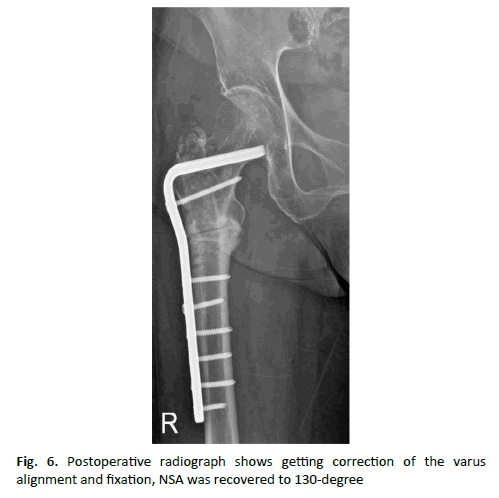 In both cases, 95-degree condylar blade plate was used for revision fixation to achieve correction of the varus malalignment and fixation simultaneously. 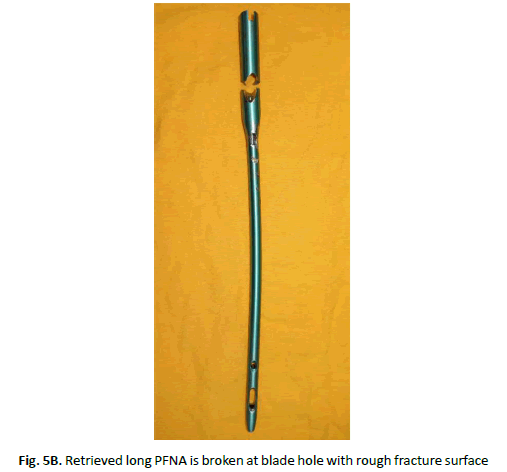 After removal of PFNA, a broad cavitary defect remained at a proximal fragment of the femur. So it is difficult to manipulate proximal fragment to obtain and maintain proper alignment. In cases of subtrochanteric fractures with non-union and varus malalignment, condylar blade plate is a useful alternative device for revision fixation. Intermittent teriparatide administration has been reported to accelerate fracture repair by enhancing callus formation . A recent report concluded that teriparatide seems to assist in the healing of atypical femur fractures and restoration of bone quality . Bisphosphonate-related atypical subtrochanteric fractures have additional difficulty in treatment, which are already technically demanding. The long cephalomedullary nail is more sound device biomechanically but less forgiving of the malreduction than in those fractures with normal bone repair potential. Good reduction with angulation less than 5 degrees and avoid varus reduction should be done whenever possible. Adjuvant teriparatide administration should be concerned in cases of non-union and implant failure with long-term administration of bisphosphonate agents. In conclusion, our retrospective cohort study of closed ankle fracture management demonstrates an overall satisfactory level of care which is, generally speaking, uniform in its approach and post-operative plans. Of course, there is always room for improvement, especially in patient transfer when in the ED, and also when listing patients for theatre. Earlier surgical fixation will not only help to reduce the postoperative hospital length of stay for these patients but will also help in reducing the financial burden associated with this. We encourage other units to evaluate their own performances to ensure that standards are met and patients are given the optimum level of care. Goh S.K., Yang K.Y., Koh J.S., et al. : Subtrochanteric insufficiency fractures in patients on alendronate therapy: a caution. J Bone Joint Surg Br. 2007;89(3):349-353. Yue B., Ng A., Tang H., et al. : Delayed healing of lower limb fractures with bisphosphonate therapy. Ann R Coll Surg Engl. 2015;97:333-338. Cao Y., Mori S., Mashiba T., et al. : Raloxifen, estrogen, and alendronate after the processes of fracture repair differently in ovariectomized rats. J Bone Miner Res. 2002;17:2237-2246. Ricci W.M., Bellabarba C., Lewis R., et al. : Angular malalignment after intramedullary nailing of femoral shaft fractures. J Orthop Trauma. 2001;15:90-95. Kuzyk P.R., Bhandari M., Mckee M.D., et al. : Intramedullary versus extramedullary fixation for subtrochanteric femoral fractures. J Orthop Trauma. 2009;23(6):465-70. Luo Q, Fang C, Shen W. Y., et al. : A lesson from the failure of intramedullary fixation of atypical subtrochanteric fractures: a report of two case. J Bone Joint Surg Case Connect. 2013;3:1-4. Odina C.V., Zerwekh J.E., Rao D.S., et al. : Severely suppressed bone turnover: a potential complication of alendronate therapy. J Clin Endocrinol Metab. 2005;90:1294-1301. Russell R.G., Muhlbauer R.C., Bisaz S., et al. : The influence of pyrophosphate, condensed phosphates, phosphonates and other phosphate compounds on the dissolution of hydroxyapatite in vitro and bone resorption induced by parathyroid hormone in tissue culture and in thyroparathyroidectomised rats. Calcif Tissue Res. 1970;6:183-196. Plotkin L.I., Bivi N., Bellido T.: A bisphosphonate that does not affect osteoclasts prevents osteoblast and osteocyte apoptosis and the loss of bone strength induced by glucocorticoids in mice. Bone. 2012;49:122-127. Dell R.M., Adams A.L., Greene D.F., et al. : Incidence of atypical nontraumatic diaphyseal fractures of the femur. J Bone Miner Res. 2012;27:2544-2550. Egol K.A., Park J.H., Rosenberg Z.S., et al. : Healing delayed but generally reliable after bisphosphonate associated complete femur fractures treated with IM nails. Clin Orthop Relat Res. 2014;72:2728-2734. Kasimatis G.B., Lambiris E., Tyllianakis M., et al. : Gamma nail breakage: a report of four cases. J Orthop Surg. 2007;15:368-372. Wiss D.A., Brien W.W.: Subtrochanteric fractures of the femur results of treatment by interlocking nailing. Clin Orthop Relat Res. 1992;283:231-236. J.W. Cho, C.W. Oh, Frankie Leung, et al. : Healing of atypical subtrochanteric femur fractures after cephalomedullary nailing: which factor predict union?. J Orthop Trauma. 2017;3:138-145. Peichl P., Holzer L.A., Maier R., et al. : Parathyroid hormone 1-84 accelerate fracture healing in pubic bone of elderly osteoporotic woman. J Bone Joint Surg Am. 2011;93:1583-1587. Chiang C.Y., Zebaze R.M., Ghasem Z.A., et al. : Teriparatide improve bone quality and healing of atypical femoral fractures associated with bisphosphonate therapy. Bone. 2013;52:360-365.